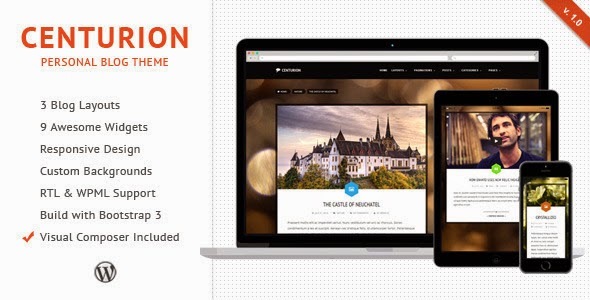 Centurion is a professional, fast loading, super-customizable WordPress blog\portfolio theme. Made with modern responsive design, awesome typography and focus on readability. Theme is developed with SEO in mind, as well as for fast page loading and security. Theme is powered by the Redux Options Panel, which provides tons of options to manage and modify any aspect of the theme – it is well suited for both beginners with no coding knowledge and developers. 9 Custom Widgets We’re trying to make your job easier, so we have included 9 custom widgets that you can easily drag and drop to activate and customize. Place the widgets in any sidebar or widget area. And we’re always adding more upon user request! Item Reviewed: Centurion New WordPress Blog Portfolio Theme 9 out of 10 based on 10 ratings. 9 user reviews.